Am I injured or am I just lazy? I’m reading a good book at the moment – “Running with the Kenyans” by Adharanand Finn. It’s an enthralling account of an English journalist’s six month immersion with Kenyan athletes training in and around Iten. He wanted to find out why Kenyans have been so spectacularly successful at winning medals for middle and long distance running events at World Championships and Olympics for over a generation. If you haven’t read the book, I won’t spoil it here, save to say that the assumption that many people have that Kenyans have some form of latent genetic superiority is largely dispelled. Indeed, I remember a former girlfriend who was from Nairobi telling me that most Kenyans are terrible runners, and just like Europeans, most Kenyans never go running. The largest ethnic group, the Kikuyu, make up about half the population and dominate the population of Nairobi, but few great Kenyan runners have been Kikuyu. The majority of the exceptional runners in Kenya hail from a small population of just a few thousand Kalenjin people living around Iten and Eldoret. An exception to this is my favourite runner of all time – the 800m World record holder David Rudisha. He is not Kalenjin, but Maasai and comes from Kilgoris near the border with Tanzania. However, he was sent to study and train in Iten with Brother Colm at St Patrick’s when he was a teenager. Brother Colm is a Irish missionary and a self-taught athletics coach, whom has mentored literally hundreds of world class Kenyan runners, including dozens of world record breakers and gold medal winners. I’m not really a believer in hero worship, but I make an exception for David Rudisha. I think he is a magnificent athlete, so elegant yet powerful, the absolute zenith of human athleticism. He is also an extraordinarily humble, modest and peaceful man. Apparently he told his Kenyan team-mate before the race that he must not try to follow him, because he was going to break the World Record (in the Olympic final – how cool is that?). As I write, I haven’t quite finished the book, but I soon will – I read the first half in a single sitting as the rain hammered down over Yorkshire on Boxing Day. I was particularly interested in Finn’s obsession with his own running form. The author would be considered a decent club runner in the UK – he was a talented junior cross country runner, but his running lapsed when he discovered booze and girls at University. Like many, he returned to running in later life. He had a 10K PB of about 38:30 when he left for Kenya. He was aware that he was a distinctive heel striker and felt that he needed to transition to forefoot striking (or even barefoot running), after reading ‘Born to Run’ by Christopher McDougall. Since I resumed serious running training in 2008, my 5K time has improved from around 22 minutes to 17:35. When I was a slower runner, I was a clumsy heavy heel-striker. I wore big stability trainers because I believed that I was a hopeless over-pronator. I used to get knee pain and wore jumper’s knee bands to alleviate the pain and to allow me to continue running. It took me a few years of consistent running before I saw any significant progress – I got stuck for about three years with a 5k PB of just over 19 minutes, I thought that I would never be able to beat that time and even if I did it would be the best time I could ever achieve. Of course, I was getting fitter, but I didn’t seem to be able to go faster. Clearly, big heavy shoes and heel striking weren’t helping my speed. I think I had an epiphany one day watching the triathlete and fellow Bramhope resident Alistair Brownlee on television. Alistair runs right up on his toes, his feet springing him along to win so many top class triathlons with searing 10K runs at the end of the competitions. I watched other great runners – they all run on their toes. That must be it I thought – maybe I should try it. Of course it is not easy to change one’s running style, but I think that over a number of years, I have achieved at least a partial change. In shorter races, say up to 10K, I think that I normally contact the ground with my forefoot or midfoot, though I am sure that when fatigued or when shuffling in longer races or long training runs I lapse back into heel striking. I have given up on the big stability and motion control shoes to a large degree. I wear neutral shoes most of the time and wear racing flats for target 5ks and 10Ks. In marathon races I wear a fairly minimal racer-trainer. Running on my toes has caused some problems, the primary one being tenderness in my achilles tendons – usually on my left leg. I think most runners have an innate weakness, a part of their body that is the first to exhibit pain whenever they increase the mileage or the pace of their running. Having written in last week’s blog that I have had a few months of training without injury, my achilles started grumbling again this week. This was frustrating because I had two races planned for Christmas week – the Chevin Chase on Boxing Day and the Ribble Valley 10K on Sunday 27th. I did Roundhay parkrun on Christmas Day morning, starting steadily and running each mile progressively faster. Afterwards, we enjoyed the traditional Valley Striders Christmas Morning drinks and mince pies round at one of my team-mate’s house. As I got out of bed on Boxing Day morning, I winced as I put my foot down and felt the dreaded pain shooting up my achilles. 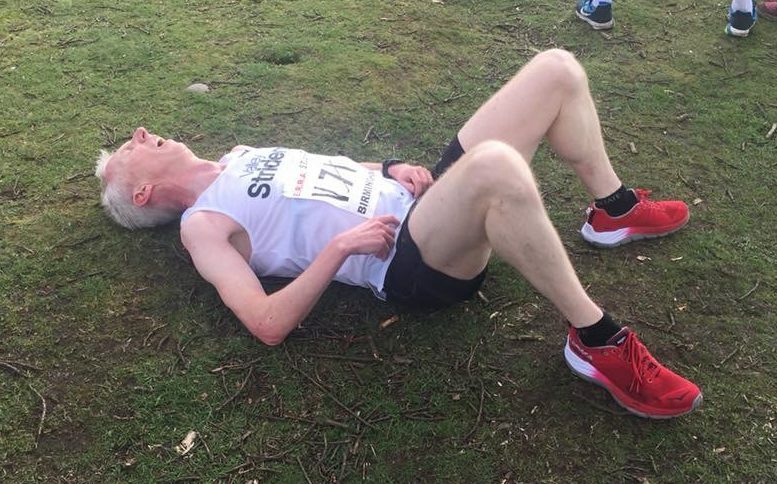 It felt very sore and straight away I knew that I probably shouldn’t run the Chevin Chase. As it happens, conditions were terrible – a deluge of torrential rain. I am sure that my team-mates thought that I had wimped out when I didn’t make the start line. I hadn’t – I actually quite enjoy running in heavy rain, but I wanted to rest my achilles in the hope that I could still try to run a fast time in Clitheroe at the Ribble Valley race. In the end, it didn’t matter because the awful floods in Lancashire and Yorkshire meant that the Ribble Valley race was cancelled. This may be a blessing as I doubt that running a flat-out 10K with a dodgy achilles is a good idea. Because of the horrendous weather, I didn’t even leave the house on Boxing Day. I just mooched about all day, splitting my time between reading the book, watching the cricket on TV and trying to teach myself how to play the theme from ’The Detectorists’ on guitar (I failed miserably). It was thoroughly depressing. Angry with myself at my sloth, at 6.00pm I changed into sportswear and jumped on the rowing machine, chastening myself to row 10 kilometres in 45 minutes. Ten kilometres on a rowing machine is a bloody long way I can tell you. I helped pass the time by listening to the ‘Infinite Monkey Cage’ podcast, which was conveniently 45 minutes long. With no race to do on Sunday, I turned up for the club’s long run. The achilles was tight at first, but felt OK once I was warmed up. Although only ten miles were planned, the miles flew by and I ended up running an extra 8 miles at the end with Sam. It was a very enjoyable run and felt great to run 18 miles at 7:45 pace without it feeling tough.